When you first think of "pink" you may picture a shade something along the lines of Hubba Bubba bubble gum.... at least that is what comes to mind for me! Well that's not all that this wonderful colour is all about!!! In the world of wedded bliss, the gloves come off and we can see that there is so much more to PINK than simply Hubba Bubba Bubble gum! Now that we have the bling taken care of... let's talk about something we love. The loveliness that is flowers! Whether they be the romantic type or have that wow factor, they are a statement that is made starting right at the ceremony. A favourite these days are the peony (*sigh* ... so romantic!). Lush and beautiful it is perfect for that romantic celebration that will just take everyone's breath away.... such a feel-good choice for your florals! 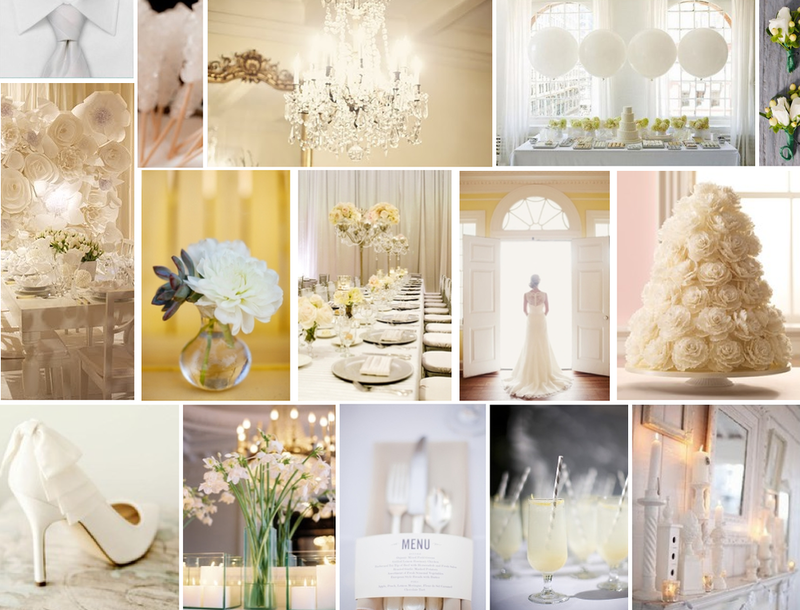 For your "fix" until then.. check out our "Pinks and Pearls" inspiration board! In awe of how beautifully romantic this gown is!!! Perfect to dress your bridesmaids in. Looking for that all-around wow factor ...... you're headed in ther right direction with this gorgeous number by Blumarine. Now if you are like me and love to entertain guests... here is a setup that might just make you want to get out that party planner! 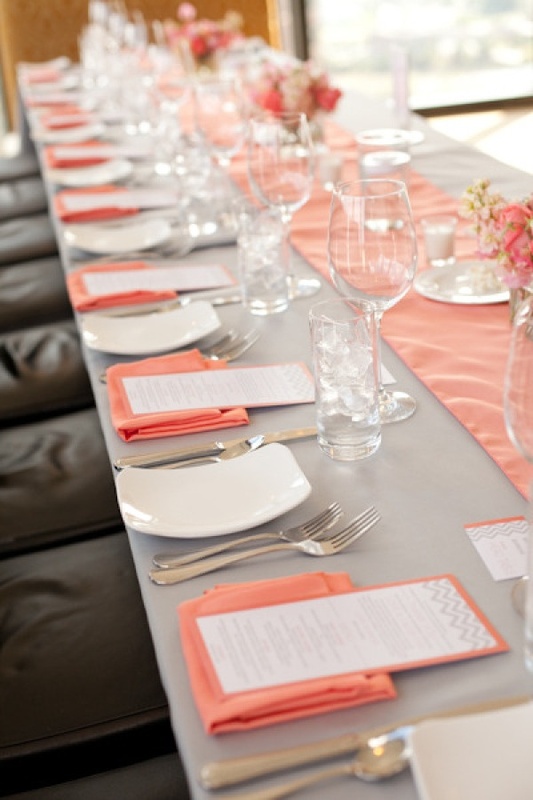 Such a lovely colour combination that lends perfectly to a Sunday Brunch or a Bridal Shower! Add a splash of fresh florals and you can complete your "party plan"! Inspiration Fridays ~ White on White Weddings! The truth is, done in the right way; a white themed wedding can be gorgeous. Get the lighting, tones and textures spot-on and you can and will create a fairy tale like ambience. I don’t think it should be 100% white as you will get odd hint of colour from your venue furniture and décor, so choose a location where it will all tie in together nicely. This wedding board below screams out sophistication & elegance as well as encapsulating high fashion. The hint of green is a nice way to break up the monotone white palette. A combination of different whites and creams adds warmth especially when it is enhanced with good mood lighting. A chandelier not only adds a great crystal white but reflects opulence and grandeur. Many brides are also opting to share their white gown moment by also dressing their bridesmaids in white. 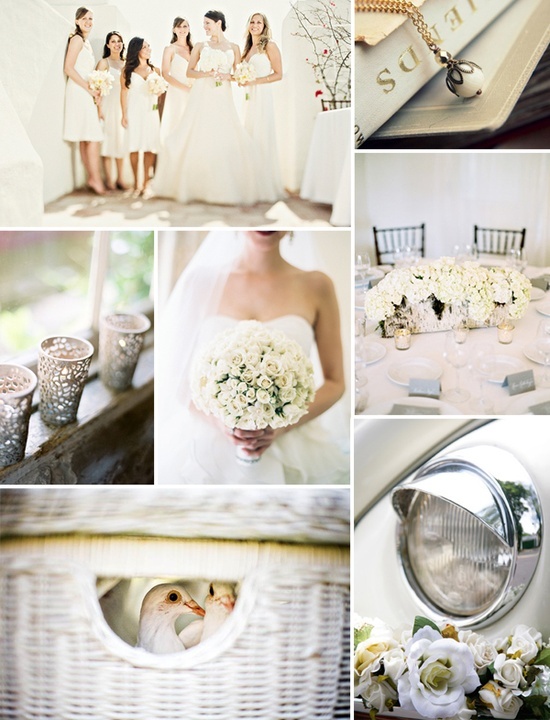 Don’t forget the small and big details from candle holders to doves, to the "getaway car" ....anything can be white! Go for the "glitz & glam" look by adding some sparkles and really make that white wedding shine! The Lit Chick blog delves into the world of white and below is a sample of some of the many shades available. Will it be an all-white wedding for you? We've peaked your interest haven't we! ~ Inspiration Fridays ~ Refreshingly Minty! 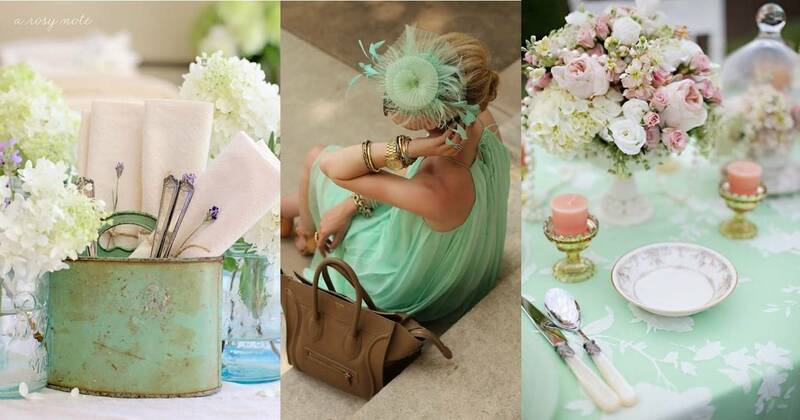 We are loving that mint soared through the spring summer season of 2012 and is still making a statement in wedding trends for 2013 as the hottest colour. This top colour is fresh, chic and retro with the ability to blend with an ascent colour to create that gorgeous palette for your wedding. It can be incorporated in everything from invitations, bridesmaid dresses, décor, cakes, flowers, jewellery and much more. Envision your perfect combination of mint elements with help from these inspiration boards below. The mint colour just comes across so cool, bright, light and airy yet with a certain warmth! It is just one of those feel good colours that adds joy and bounce, just what you want from wedding. It is so versatile that it can be interpreted in a modern or vintage way. See the comparison between the board above and below but both are stylishly elegant. We love the idea of mint choc chip ice cream, ideal for a summer wedding. Looks great and tastes even better! That goes for the cakes and macaroons too. Our mouths are watering already! We hope this has inspired you to go green!